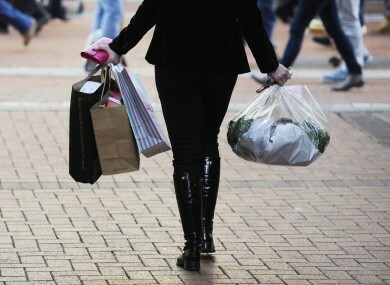 The KBC Ireland/ESRI index showed a small amount of growth though consumers still have a gloomy outlook of their household finances and unemployment. CONSUMER SENTIMENT SAW a slight increase this month following a sharp drop in September which economists said was due to speculation around the upcoming budget. The KBC Bank Ireland/ESRI Consumer Sentiment Index for October rose modestly, edging from last month’s 60.2 to 60.9. This compares to a reading in October last year of 63.7. Kevin Timonry of the ESRI said an improved perception for purchasing durable consumer goods and recovering expectations of economic performance over the coming 12 months contributed to the stabilisation of the index. Declines continued in consumers’ view of the outlook for their household finances over the next 12 months, in their view on their financial situation compared to a year ago, and in their expectations of unemployment over the coming 12 months. Austin Hughes of KBC Bank Ireland said the index results over the last couple of months indicate that Irish consumers have become “a good deal more nervous”. “The fragile nature of sentiment at present means that while Budget 2013 will be painful it must also be designed and presented in a way that consumers see as providing some prospect of an improvement in domestic economic conditions during the coming year,” he said. Email “Consumer sentiment stabilises after sharp decline in September”. Feedback on “Consumer sentiment stabilises after sharp decline in September”.